In situ hybridization methods have become indispensable tools in molecular cytogenetics because they allow for the localization of specific sequences of DNA and RNA in cells, linking molecular information to structural studies (14,15). In Drosophila, these techniques are especially suitable because of the existence of giant polytene chromosomes, which also show a distinct and reproducible banding pattern. Originally, in situ hybridization studies employed radioactively labeled DNA probes and light microscopy (16). Subsequently, methods for detection of nucleic acids by biotin-labeled (17-19) or digoxygenin-labeled (20) probes were developed. Attempts to increase the resolution of the method led to the elaboration of nonradioactive in situ hybridization at the ultrastructural level (21,22). As for polytene chromosomes, Wu and Davidson (21) developed a method using colloidal gold spheres photochemically crosslinked to single-stranded DNA fragments. Another approach was taken by Kress et al. (23), who used biotinylated DNA probes to surface-spread Drosophila chromosomes. Neither of these methods gained wide recognition, probably because of technical difficulties. Fig. 4. Electron micrograph in situ hybridization of the 3AC region of the X chromosome with a Carnegie-20 DNA probe. 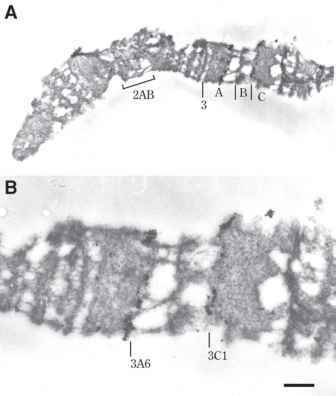 (A) General view of the telomeric region of the X chromosome and (B) magnified fragment. The transgenic strain with a P-lArB construction inserted in the 3A4-6 region was used. P-lArB contains DNA of the rosy gene. The Carnegie-20 plasmid carries 7.2 kb of the rosy gene and approx 700 bp of the Drosophila white gene. Hybridization signal appears in both the 3A4-6 and 3C1 regions, corresponding to the P-lArB insert and the endogenous white gene, respectively. Scale bar: 1 |im. (20). 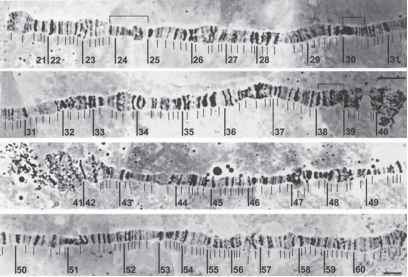 In comparison with EM specimens prepared by conventional methods, the denaturation, saline washes, and hybridization steps of this method affect chromosome structure: The large bands swell and become indistinctly gray and they occasionally fuse with neighboring bands (see Fig. 4). However, the chromosome regions remain recognizable and the localization of label on the chromosome correlates well with the results obtained with other methods. Fig. 5. 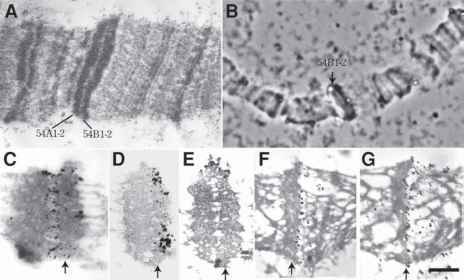 Localization of the mbl gene in the 54AB region of chromosome 2R by EM in situ hybridization; (A) EM map of the 54AB region; (B) light microscope and (C-G) EM in situ hybridization pictures. The 54B1-2 band is indicated by the arrow. The mbl gene covers >100 kb (26). DNA probes from the 3' (S4), middle (+62), and 5' (mblHl) parts of the gene were used. The locations of hybridization signals are consistent with the molecular data (26); the S4 probe is localized in the interband region 54A1-2/B1-2 (C), +62 probe in the 54B1-2 band (B,D,E), and the mblH1 probe in the 54B1-2/B3 interband (F,G). In ultrathin serial sections, the distribution of gold particles is different for the dense and decondensed regions: in interbands, label can be found in all sections of series (F,G) but in condensed bands, only in the first one to two sections (D,E). Data indicate that the mbl gene is orientated in the direction from centromere to telomere, consistent with data from the Drosophila genome sequencing project. Scale bar: 1 |im. EM method are compared. The high resolution and specificity of probe location was shown for the P-lArB insertion and the white gene in a D. melanogaster transformed line (see Fig. 4). The method was also used for the fine mapping of the mbl gene, localized in the 54AB region of polytene chromosome 2R, which we were able to orientate on the chromosome (see Fig. 5).